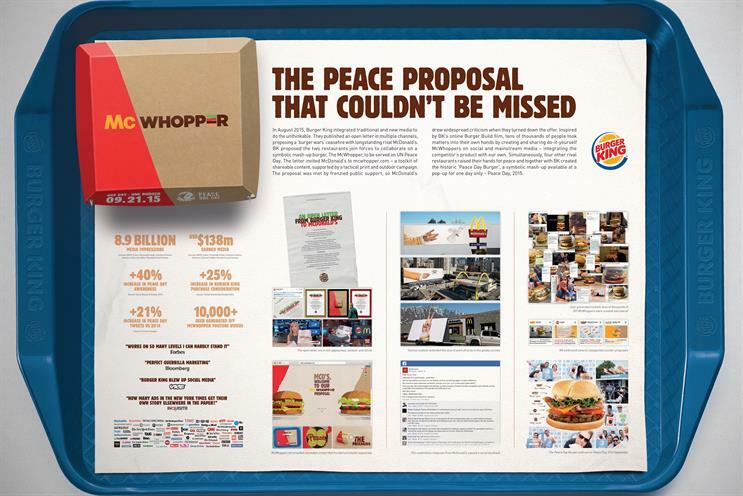 Burger King's McWhopper has picked up another Grand Prix, this time in the Media Lions at the International Festival of Creativity in Cannes tonight. The work was created by Y&R New Zealand Auckland and has already won a Grand Prix for Print and Publishing. The UK picked up seven gongs but there were no gold Lions with four silver and two bronze awards. OMD UK picked up three Media Lions: two silvers for Channel 4’s "Humans" and 1 bronze for "Hunted" (also for Channel 4). Dan Clays, OMD chief executive, said: "I am proud of all the work we do with Channel 4, one of our longest-standing clients, but we knew 'Humans' and 'Hunted' were special. "To be recognised at such a prestigious event really is the icing on the cake and I want to thank Channel 4 and all our agency partners, 4Creative, Fuse Sport + Entertainment, AOL Microsoft advertising, eBay and Talon, for making these brilliant campaigns possible." Meanwhile Carat won a silver Lion for the Pimm’s "Grab a seat it’s Pimm’s o’clock", and PHD landed a silver Lion for the Sainsbury’s Christmas campaign "Sharing the gift of reading at Christmas". McCann London won a bronze Lion for Microsoft XBox's "Surival billboard". The work has also been awarded at Cannes this week in the Cyber, Direct and Outdoor Lions. Manning Gottlieb OMD also took home bronze for John Lewis' campaign to end loneliness, which followed the Christmas 2015 work which in which a girl sends a telescope to a lonely old man living on the moon. US agencies went home with 17 awards, also with no golds but eight silvers and nine bronze gongs. Grey New York led the way with four awards with a bronze and silver for "Gun crazy" for States United to Prevent Gun Violence, a bronze for "Unknowns" for Canon USA, and a bronze for "Highway robbery" for Volvo Car USA.